"Our job is to fulfil our responsibility to the audience, but to do that, we need to look carefully in the mirror," said Lord Tony Hall, director general, BBC, speaking at News Xchange in Edinburgh today (14 November). "The need for us to work together has never been greater – what unites us should not be a shared sense of threat, but a sense of values. "It is hard to remember a time where journalists have been deliberately targeted in the way they are today, but we need to defend our role and seek out the facts no matter how difficult they may be for others – we need to stick together." Lord Hall believes public service journalism from the BBC has a unique role in that mix, giving an impartial and fair reflection of the world as they understand it, but also giving audiences stories in the way that best serves them, in they way they want. So how will the BBC move forward in the coming year? Lord Hall explained the importance of the public service broadcaster taking greater responsibility to tackle dis- and misinformation. "That's the sort of journalism I want to back – it takes time, skill, resources and a commitment to uncover what is real and what is not," he said, referencing recent work the BBC's new investigative unit, Africa Eye, which used open-source tools to verify a video from sub-Saharan Africa that had gone viral on social media. "From early next year, we will be training more journalists in the art of open-source media, working with others to mine data to get the stories we otherwise couldn't cover." "We must aim to report what has happened, but also why it has happened and why it matters – and that, in essence, is what public service journalism is about," he said. "Without explanation, everything can seem random, confusing and overwhelming, and if the world seems that way, no wonder people find it hard to engage." Offering insight instead of headline will be a core focus for the broadcaster, with an approach made up of three elements: what has happened, what it means, and then context and detail. 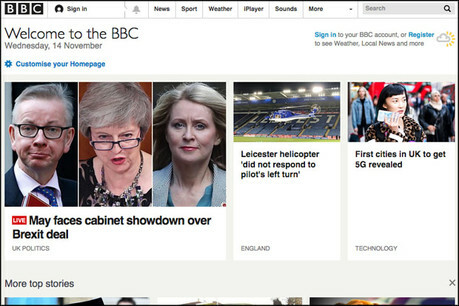 For example, on the anniversary of the financial crisis of 2008, the most-read piece on the BBC News online was a 5,000 word article on why it happened, what has been done about it and why it still matters. The broadcaster's Reality Check team was developed to investigate trends, but Lord Hall wants to see reporters across the organisation embrace data so that the analysis is relevant and immediate within the organisation. "We need to be enabling audiences to judge who is telling the truth," he said. "There's so much more information out there, a flourishing world of facts and figures and our job is to collect, curate and then make them available to our audience – bringing us closer to them." For example, a recent story helped audiences see how their local hospital was performing, enabling them to check NHS cancer, A&E, operations and mental health targets in their area – without it, they would struggle to find and interpret the data. The publisher has specialists on all aspects of coverage, existing in many different parts of the organisation. "First-hand knowledge matters. Journalists on the ground matter. It makes a huge difference to the authenticity of what we do," he said, explaining that local experts in the publisher's BBC Monitoring team reports and analyses news from media around the world. "People are engaged with what's important to them," he said. "News is quite often, and quite rightly about conflict, on the clashes of people and ideas, but I think there should also be times where we step back from that and report on solutions – not just stopping at the problem. "We need to show what's being done and what the solutions are." "News organisations should have people from all sorts of backgrounds, arguing about what is news and what stories should be covered and how," he said, noting that it makes for a stronger news team. "We must ensure we promote the full range of talents, regardless of gender, ethnicity, social background, or whether they are disabled or abled. He noted that he is not looking for people to just 'fit in', instead, he wants people to challenge the BBC's tone and the stories it covers. "Don’t let anyone tell you our long, honourable trade is no longer fit for purpose. I have huge confidence in our future. The big picture is a simple one: the public believes in public service journalism," he said. "There’s never been a more important time to be a journalist. There’s never been a time when our audiences need us more. We all have the right to be able to access information we can trust - because it’s only by being informed that we can make effective choices."